Sorry for another Kia blog post (really I'm not obsessed), but in doing research for the Kia Soul Collective an ad network media buy must have picked up that I was a Kia shopper and sent a Moochie expandable ad unit to a site I was viewing. A what? A Moochie. ACR New York, a creative advertising agency produced six-webisodes for the all-new Kia Soul campaign in collaboration with the David & Goliath agency. 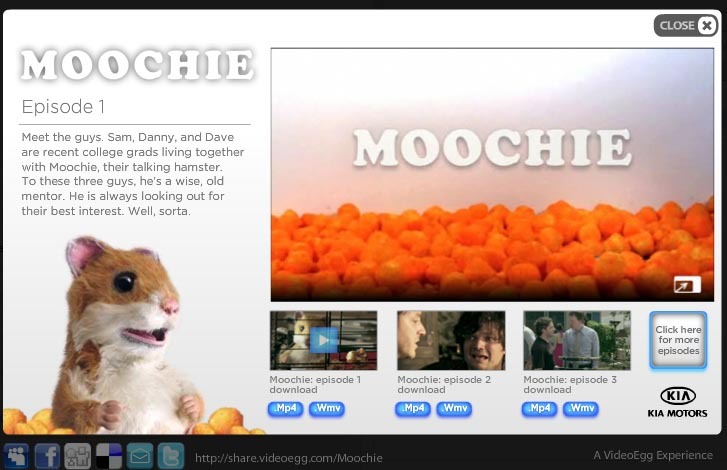 The experience called "Moochie Mania" is another attempt to appeal to the youth market. The six-webisodes feature three recent college graduate friends trying to save their pet hamster. The hamster not only talks, only the three friends can hear his words, but the hamster is dying of a heart condition. It’s a real tug at your heartstrings story that is well sure to appeal to… someone. 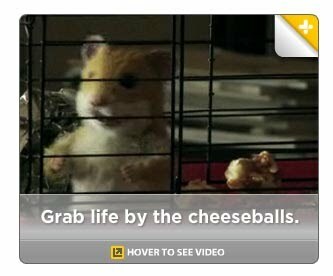 The hamsters have severed Kia well on the Soul campaign. With over a million views of their Hamster TV spot on YouTube, the hamsters are definitely viral (I added up several posts of the TV ad to get the over million number.) 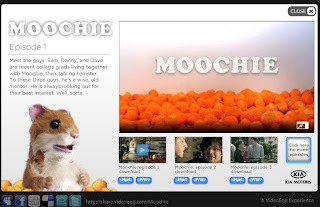 To further extend that viral interest, Kia’s marketing team is promoting the “Moochie Mania Webisodes” on YouTube’s Promoted Video area when you search for the Kia hamster commercial, plus they are running a media buy outside of YouTube. Episode One was launched two months ago and did generate a fair amount of traffic to the YouTube video with over 50,000 views that is fairly decent assuming a minimal advertising spend. The other two episodes (#2 & #3) have considerably fewer views that are pretty common in a staggered strategic approach. It’s my professional guess that the remaining three episodes still to come will perform even worse. Why? Because staggered video content strategies assume an audience is growing and that early visitors are likely to return. But my experience and watching similar efforts like Audi’s Meet the Beckers, shows that visitors do not return. So unless the media plan increases as episodes launch, the later released content will not generate as much traffic. Staggering really doesn’t make much sense for the main reason that most of your media spend, for an attempt at a “viral” effort like this, is at the debut of the first episode or two. Beyond that the team waits to see if the effort catches on and if it doesn’t the campaign moves on to the next idea and lets the remaining episodes launch as planned without much care. The better idea is to have all the content available at launch for people to engage with and hopefully share if they find it compelling. The best idea is to plan your media spend in a staggered way too. Spread the media spend so that you spend say 30% at start and then spread out the other 70% as episodes are released, changing up where you buy as you learn what buys are performing best for this sort of content. Kia may be doing this for all I know, I'm just assuming their approach is similar to most. Spend the wad early and hope for a viral spark to ignite interest. Maybe Moochie could catch the enthusiasm of a popular kid’s toy that is all the rage this season – Zhu Zhu. Kia’s hamster looks very similar to the Zhu Zhu toys and there certainly is considerable buzz around them. It would’ve been pretty funny seeing a co-marketed product where one can buy a Zhu Zhu with a toy Kia Soul he can drive. Maybe that will cause some buzz even beyond the buzz of the original TV commercial. Short of a major marketing alignment with a popular Christmas toy, the Moochie Mania probably won’t be much of a mania. It takes considerable, consistent ad spending to generate enough interest in a campaign like this and with all of these various efforts for the Kia Soul -- launch site, Go Hamster Go game on Facebook, Kia Soul Collective, this and I’m sure others efforts – it is probably a good guess that the marketing budget is getting spread pretty thin. We agree, don't expect the audience to return. While we did stagger our uploads as editing was completed, we didn't kick off the vast majority of the media buy portion until the upload of episode 6 for that reason. Also, we do use behavioral and re-targeting extensively...glad to see it worked. - The man behind the man behind the man. Thanks for sharing and good to hear your team is avoiding the mistakes made by others who venture into the graveyard of webisode content. And yes I did get re-targeted which is proof your media buy is working. Got to love that! Keep up the great work. The whole hamster thing is working very well for Kia.